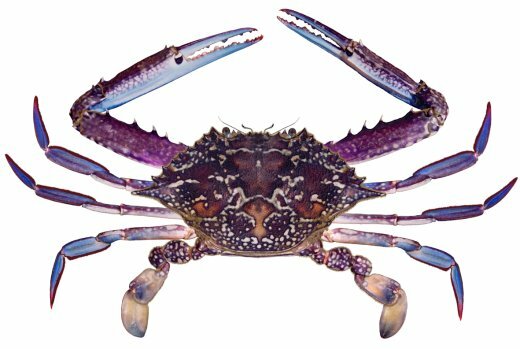 Blue Swimmer Crabs, also known as Sand Crabs or Blue Manna Crabs, are swimming crabs that have their last pair of legs modified to act as paddles. Their claws are long and slender and the shell is rough in texture. The carapace is broad, with a prominent spine on each side. The colours vary from dark brown, blue and purple, with pale mottling. Adult crabs are frequently found in large numbers in shallow bays and estuaries, particularly during the summer months. Blue Swimmer Crabs are highly regarded for their taste. Maximum length of about 21 cm across the carapace (shell), and a weight of up to 1 kg. Blue Swimmer Crabs are found in coastal waters from Cape Naturaliste in Western Australia, around the top end to NSW. The Victorian border is the southern limit for distribution of the species on the east coast.